Florida is one of a few states that allows you to bypass an expensive, time-consuming divorce process if you and your spouse meet certain criteria. Most important, you must have an agreement between you as to how you’re going to divide your property and debts; you cannot have any children and both you and your spouse must waive alimony and your right to appeal any part of your divorce agreement. If you meet these requirements, you can file a Petition for Simplified Dissolution of Marriage and be divorced, usually in less than a month. Prepare a marital settlement agreement explaining to the court how you and your spouse are going to resolve financial issues between you. Use Florida family law form 12.902(f)(3), which you can access from the state’s website. 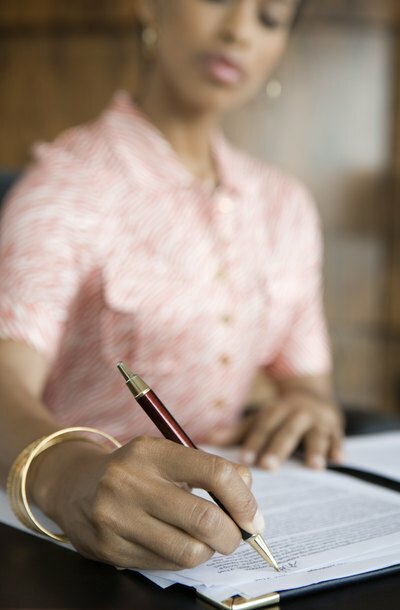 You and your spouse must complete the form jointly, and both of you must sign it. There’s no need for each of you to submit a separate form of your own. Access form 12.902(b) or form 12.902(c) from the state’s website. These are financial affidavits listing your income, assets and debts. You and your spouse must each file one of your own; this isn't a joint form. Form 12.902(b) is applicable if you, individually, earn less than $50,000 per year. Use Form 12.902(c) if you earn more than that. Complete Florida family law form 12.902(j), also available from the state’s website, confirming your Social Security number. You and your spouse each need to complete one of these forms. Take your completed forms to the family court in the county where either you or your spouse reside. You and your spouse must appear at the court clerk’s office together. Take a photo ID with you. Ask the clerk for a form for a simplified dissolution of marriage. Complete the form with both of your signatures and file it with the clerk along with all the other required forms you’ve prepared. Either you or your spouse must substantiate that you’ve been a resident of Florida for at least six months to file for any divorce in Florida. If you use your Florida driver’s license as your photo ID, the court clerk will accept this as proof, as long as it is at least six months old. You can also take a witness with you when you appear in court for your final divorce hearing; the witness can testify that you’ve lived in Florida for the required time. If your witness doesn’t want to appear in court, she can complete form 12.902(i) and have it notarized, attesting that you’ve met Florida’s residency requirement. California offers a summary divorce option for ending your marriage quickly, but this doesn’t avoid the state’s six-month waiting period. Whether you qualify for a summary action or must use the state’s uncontested divorce procedure, the soonest you can finalize your marriage is six months from the date you file your petition. Filing for divorce in Louisiana can be simple or complicated, depending on whether you know the whereabouts of your spouse. If you don't, you'll have to take extra steps. Otherwise, the procedure is relatively straightforward. Does the State of Florida Recognize "Abandonment" as a Reason for Divorce? All states recognize no-fault divorce, but many states also allow spouses to file on fault grounds such as abandonment. This isn't the case in Florida. Even if your spouse leaves or abandons you with the intention of ending the marriage, you can only file for divorce by telling the court in your petition for dissolution that your marriage just isn't working out anymore. However, you may be able to bring the fact of your spouse's abandonment to the attention of the court in other ways.